Located in the heart of Miranda de Ebro, this hotel is 2.4 mi (3.8 km) from Castle of Miranda de Ebro and within 12 mi (20 km) of Bodega Rafael Lopez de Heredia and Bodega La Rioja Alta S.A.. Bodegas Gómez Cruzado and Bodegas Muga are also within 12 mi (20 km). Miranda de Ebro Station is only a 1-minute walk. Located in the heart of Miranda de Ebro, this hotel is 2 mi (3.2 km) from Castle of Miranda de Ebro and within 12 mi (20 km) of La Fortaleza de Santa Engracia and Valderejo Natural Park. Bodegas Tobia and Bodega Rafael Lopez de Heredia are also within 12 mi (20 km). Miranda de Ebro Station is 26 minutes by foot. Located in the heart of Miranda de Ebro, this hotel is 3.5 mi (5.7 km) from Castle of Miranda de Ebro and within 12 mi (20 km) of La Fortaleza de Santa Engracia and Valderejo Natural Park. Bodega Rafael Lopez de Heredia and Bodega La Rioja Alta S.A. are also within 16 mi (25 km). Miranda de Ebro Station is 16 minutes by foot. Situated in Miranda de Ebro, this residence is 1.3 mi (2 km) from Castle of Miranda de Ebro and within 12 mi (20 km) of Valderejo Natural Park and La Fortaleza de Santa Engracia. Bodegas Tobia and Bodega Rafael Lopez de Heredia are also within 12 mi (20 km). Miranda de Ebro Station is 17 minutes by foot. How Much is a Hotel Room in Miranda de Ebro? Hotels in Miranda de Ebro start at $46 per night. Prices and availability subject to change. Additional terms may apply. Are you planning on traveling to Burgos and hoping to reserve accommodations in the Miranda de Ebro area? The center and surrounds of Miranda de Ebro offers 6 excellent accommodation options within a 6-mile (10-kilometer) radius. Travelocity-listed hotels located within a close distance of central Miranda de Ebro, are the Tudanca Miranda and Hotel Sercotel Ciudad de Miranda. 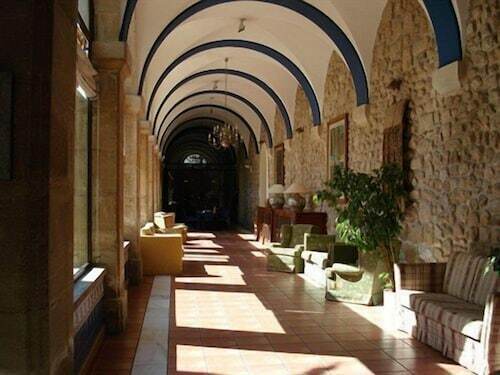 Check out the Parador de Santo Domingo de la Calzada along with the Hotel Jardines de Uleta Suites. The Parador de Santo Domingo de la Calzada is positioned 16 miles (26 kilometers) away from the main part of Miranda de Ebro. The Hotel Jardines de Uleta Suites, is situated 17 miles (28 kilometers) away. Some more places to stay in this neighborhood include the Hotel Los Agustinos along with the Parador de Santo Domingo Bernardo de Fresneda. The larger Castilla - Leon region is worth checking out too. Castilla - Leon is well known for rivers, and commonly visited sights include old towns. In this fascinating part of Spain visitors may try their hand at rock climbing. The nearest places to stay in Burgos include San Medel and Rabe de las Calzadas. San Medel is 40 miles (64 kilometers) to the southwest of Miranda de Ebro, while Rabe de las Calzadas is 50 miles (82 kilometers) to the southwest. Travelocity-registered hotels in San Medel are the Hotel Camino de Santiago and Hostal-Restaurante Iruñako. The Hotel Rio Cabia and Albergue de turismo superior La Fábrica are a selection of the Travelocity-registered accommodation options in Rabe de las Calzadas. While in town, don't miss out on enjoying the spectacle in the company of fellow lovers of sport at a local sporting fixture. You can find San Mames Stadium 40 miles (65 kilometers) to the north of Miranda de Ebro. Modern travelers who would like the convenience of booking a hotel not far away, make a reservation in the Gran Hotel Domine Bilbao or Hotel Miro. This is a beautiful, cozy apartment with so many thoughtful details. The location is amazing and the host was wonderful to work with - very sweet and responsive. She also gave us great winery recommendations and everything is very walkable. My husband and I loved our stay here and hope to be back! Would highly recommend! Hotels near Bodega La Rioja Alta S.A.